Enthusiasts for walking in the Lake District are blessed with a wealth of guidance from many different authors, themselves passionate and experienced fellwalkers. The splendid Fellranger guides by Mark Richards, come complete with beautiful colour photography and extracts from Harvey maps to point you in the right direction on your Lake District walks. The Fellranger series sits alongside Wainwright as the ultimate guides to walks in the Lake District for the 21st century, each author having his own particular style. As you plan your days out look at the two side by side. You may follow one or the other, or in some cases combine the routes. Mark Richards has also made DVD videos of some of his splendid Lake District walking routes. Backpacking in the Lake District with Chris Townsend. 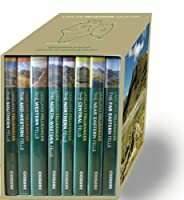 Remember, you can buy the Helvellyn DVD and the other videos here on "The Lake District in Books"